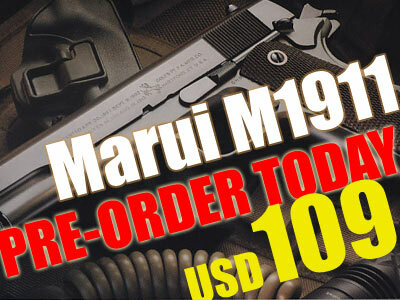 Much anticipated in the lineup is a single stack 1911 Gas blowback. This latest pistol should be interesting as it will challenge WA's lineup of 1911 framed pistols on price and performance! Using a simple yet effective design, this 1911 will deliver decent power using both HFC134a and TOP gas. Full size removeable metal magazine, metal hammer, trigger, and safety switches. This pistol was launched in Japan market on 29th June and already arrived the RedWolf Store today. Buy now! * The pre-order discount is over.